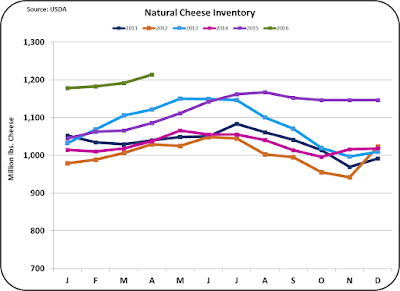 Cheese inventories are in the news. There was a recent article in the Wall Street Journal and Maria Bartiromo had a section on cheese in her morning Fox TV broadcast this week. The same story has played out in other news sources as well. 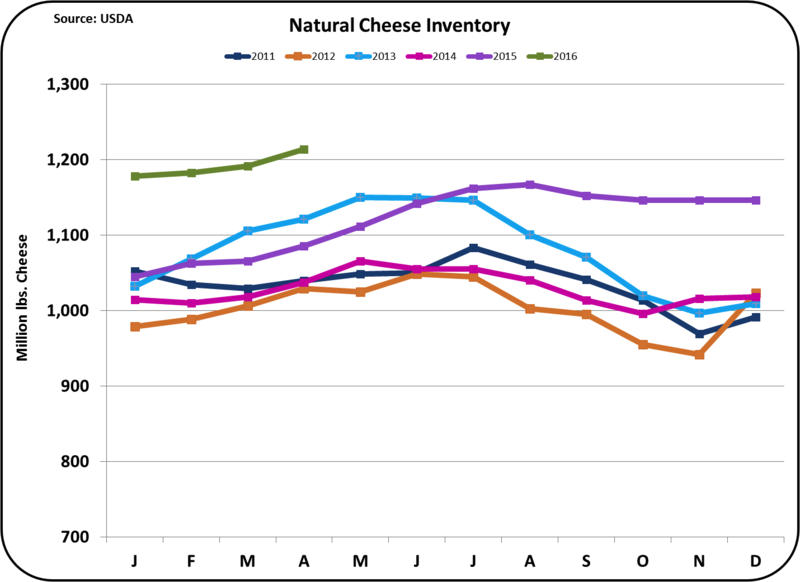 Everyone is recognizing that the U.S. has too much cheese in inventory. One statistic mentioned is that everyone in the U.S. would have to eat three pounds of cheese, in addition to what they normally eat, to bring the stocks to reasonable levels. This statistic is certainly not correct. There has been little discussion on why we have the huge inventories except that maybe too much has been produced. There have been no reasonable plans discussed for reducing the inventories except that every person in the U.S. eat an extra three pounds of cheese. One idea discussed is freezing additional products like cheddar so they can be held in inventory longer. However, if supply and demand is not in balance, this action would just raise the inventory levels which eventually need to be reduced. 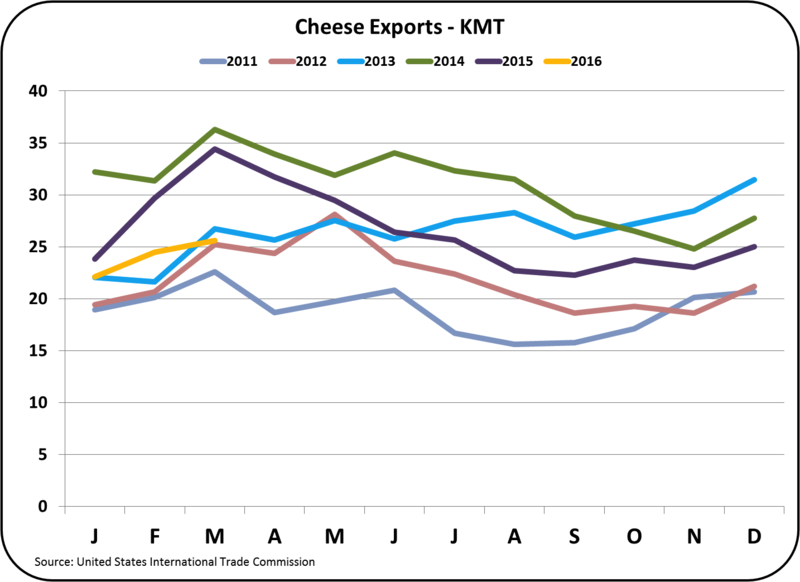 There has also been discussion that cheese makers have ramped up production and consumption has not risen to keep pace. Because domestic consumption has been constantly rising and has been for many decades, production has always increased. More on this below. Most of the news has missed the most important issue and that is free trade of dairy products in global markets. 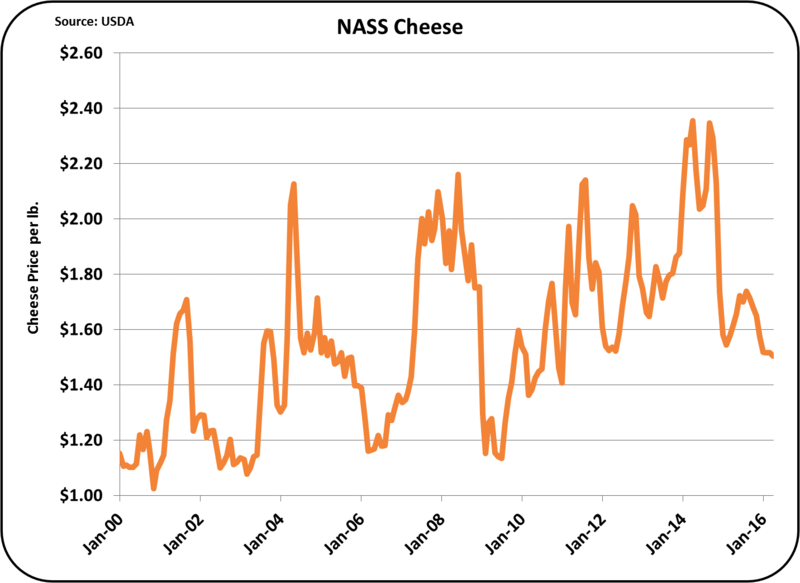 Cheese inventories have been climbing for many months. As shown in the chart below, inventories are clearly high. 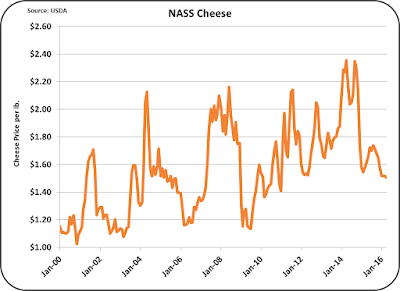 A point can be made that there is approximately 100,000,000 pounds of cheese above normal historical levels. There are currently around 324,000,000 people in the U.S. Therefore by division, there is an excess of around a third of a pound per person. The excess would not be three pounds as reported. The total inventory is over three pounds per person, but most of that is normal inventory used to manage the business and is not the root of the current problem. 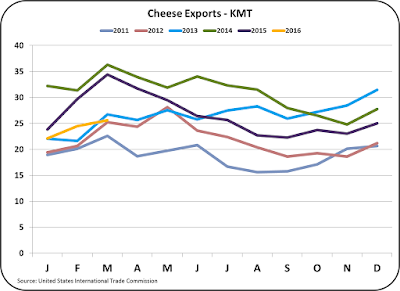 Another announcement was that cheese makers had added capacity implying that they have increased production abnormally. 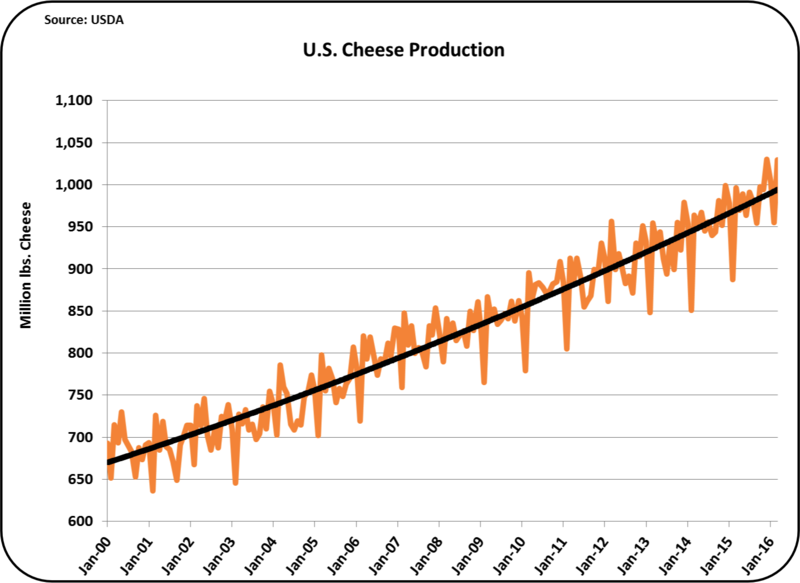 Cheese is a growing market and as shown below, is continuing to grow. The growth in production is not abnormal. High inventories always reduce the price of a commodity. Cheese is no exception. The high inventory levels are bringing about lower wholesale prices and some of this is being passed on to consumers. With lower prices, some additional consumption will occur, but not nearly enough to reduce the inventories. Why is there so much cheese inventory? None of the news reporters mentioned anything about the impact of free trade. 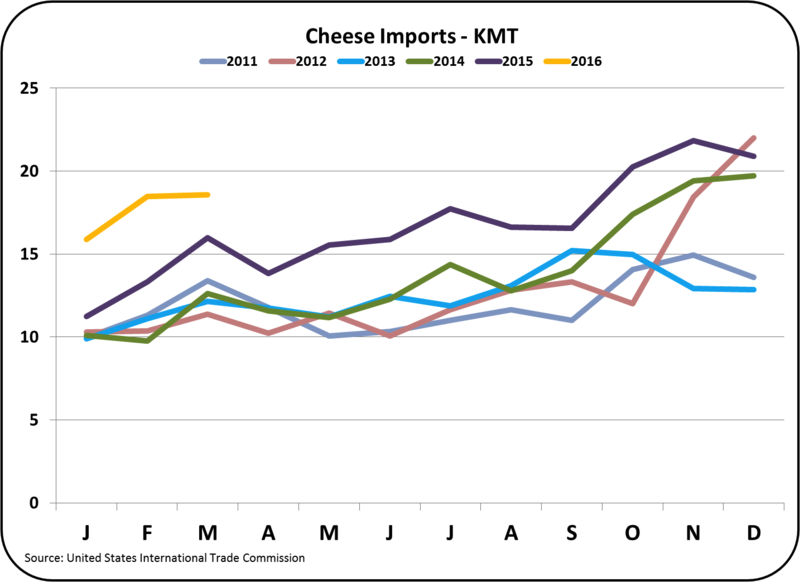 This blog will not speculate or present a point-of-view on whether free international trade of dairy products is good or bad, but the facts are that free international trade of dairy products is behind the current problem. 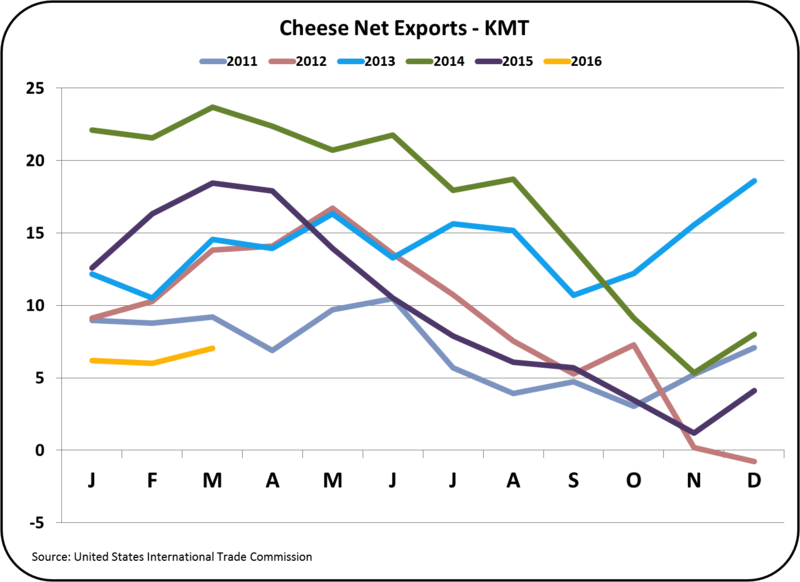 Exports of cheese are down, and imports are up as shown in the charts below. 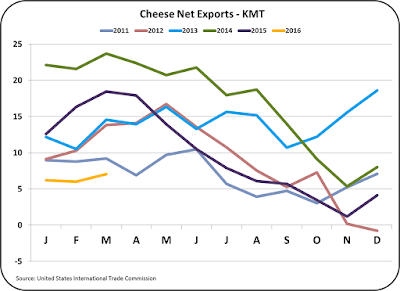 Net exports are at a six year low. The difference between 2014 and 2016 is running about 20,000,000 pounds per month. 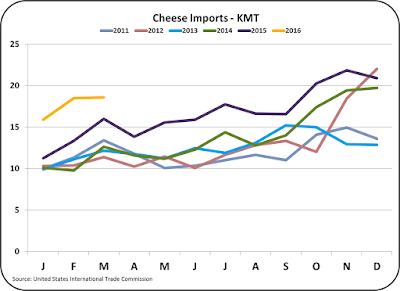 Over the course of the first three months of 2016 this would total about 60,000,000 pounds of cheese. 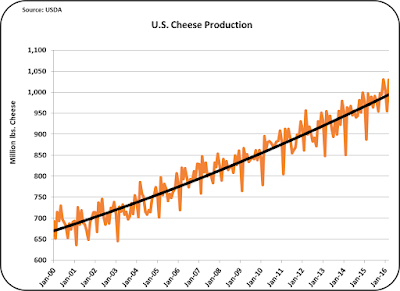 This would account for the majority of the increase in cheese inventories referenced above. Who does this impact? The biggest impact is for dairy producers. Their key formula for milk payment is very dependent on the price of cheese. The simplified formula for the Class III milk price which is the basis for initial payment for the majority of U.S. dairy producers, is as shown below. 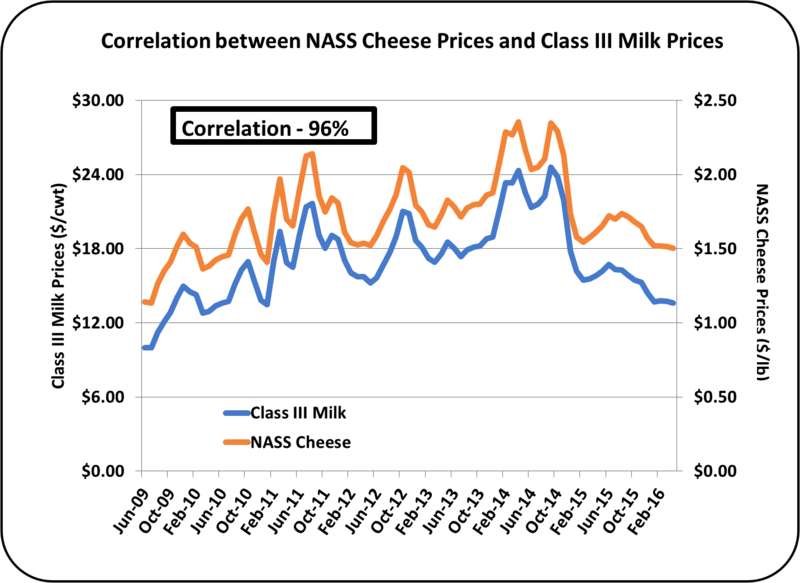 As a result of the above formula, the correlation between the Class III milk price and the price of cheese is very tight. 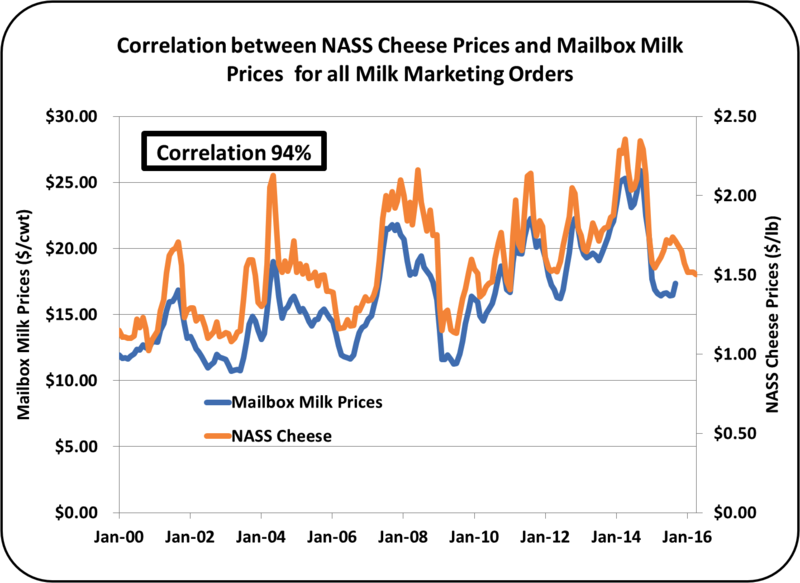 Comparing the price of cheese to the broader mailbox milk price shows a similar tight correlation. Cheese makers are typically paid based on formulas for the value added through cheese making. Milk is purchased based on NASS prices from dairy producers and cheese is sold based on CME prices. Although there can be timing differences, they can be covered by hedging. In other words, the cheese maker's financial well being is not largely influenced by the price of milk or cheese. Cheese processors buy cheese from the cheese makers. and then cut, melt, reformulate, and package cheese products, passing on only a portion of the reduced cost of cheese. The grocery and food service industry in turn, pass on some of the reduced cost of making and processing cheese, but not all of it. 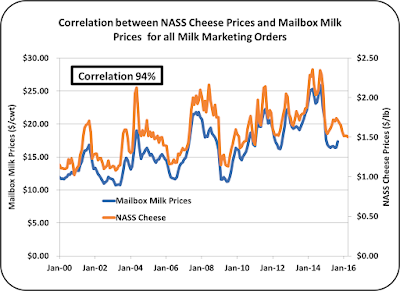 In essence, the margin for processors and retailers of cheese improves when the wholesale price of cheese declines. Dairy producers have lost any benefits of government stockpiling that once existed in the U.S. There are no direct government subsidies for tough times. The harsh economics of being a U.S. dairy producer certainly eliminates inefficient herds and pushes new tighter cost controls on producers. A recent Robobank report shows larger dairy farms are more productive and cites a minimum size of 1000 cows to be efficient. The transition to fewer but larger herds is accelerating.